This site is dedicated to helping Strathcona parents select an iPad, iPad accessories and iPad apps for their daughter. On 6th September 2011, Mrs Hughes announced to Year 8 parents at a special evening information session, that they will be encouraged to purchase an iPad for their daughter before commencing Year 9 in 2012. 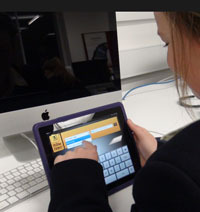 Following some small-scale trials with staff and students over the past 18 months, the School will be expanding the iPad trial to coincide with the new 2012 Year 9 program with a vision to expanding mobile learning technology throughout Strathcona in the near future. Strathcona has a partnership with Mac1 in Camberwell who are offering the following deals. (3G allows for the instillation of a mini sim card to enable Internet access anywhere that is 3G enabled. This provides the flexibility of continuous Internet access almost anywhere but does allow the students to bypass the filters and security measures in place within the Strathcona network and at home). The basic 16BG WiFi option is certainly suitable for all school academic requirements.